Sony has kept costs down on the VAIO FJ3/MW by using less than cutting-edge components. Within the chassis you'll find an Intel Pentium M 740 processor which is getting rather long in the tooth. The FJ3/MW achieved a MobileMark 2005 score of 213, helped by 1024MB of DDR2 memory and a 100GB (5400rpm) hard drive. Although an average score, it's enough to run applications without any major lag. You'll find a 14.1-inch Super-TFT display with a resolution of 1,280 x 800 pixels (WXGA). The 16:9 aspect ratio screen is excellent, offering crisp images and deep, vibrant colour reproduction. An Intel 915GM graphics adapter supports the display - an integrated card using up to 128MB of system memory. As with the processor, Sony has once again cut corners, and this is an old solution. The FJ3 achieved a score of 1105 from our 3DMark 2003 benchmark, which is suitable for office tasks. Because integrated graphics use less power than a dedicated solution, battery life benefits. We managed 243 minutes away from a power point before needing to recharge. The screen is surrounded by a thick black plastic bezel, which contrasts with the pearly-white colour of the chassis. In addition to creating more space for documents, the widescreen creates plenty of room for the keyboard. The keys are of good size, and feature a decent weighting, making it easy to type at speed. However, although the keys are firmly attached, they lack damping - moving with plenty of noise. Measuring just 21mm, and getting thinner towards the front, the chassis is strong, made from tactile, robust plastics. With a weight of 2.4kg, the FJ3 is a portable machine. While you may expect to find Gigabit Ethernet on a business-orientated machine, the FJ3 comes with a slower 10/100 adapter for connection to fixed networks. 802.11b/g Wi-Fi is in place to configure wireless networks. Connectivity is not the Sony's strongest point, and it comes without Bluetooth, Infrared or an S-Video socket. You will find a 4-in-1 card reader for saving files to an external source, however, and a tri-format DVD rewriter. A 1.3-megapixel camera is rigidly built into the top of the display, enabling video conferencing. 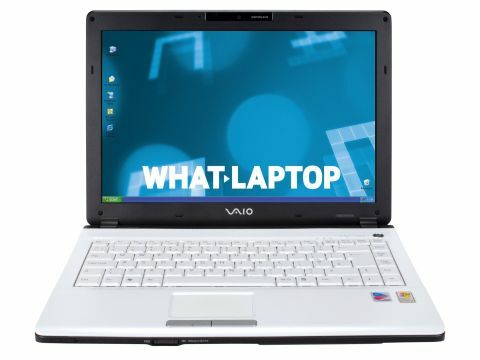 The Sony VAIO VGN-FJ3/MW offers a good mix of portability, build quality and style. However, in comparison to others, it isn't great value for money. The processor and integrated graphics card are older solutions, and many machines offer better performance for similar money.